Many developed nations are already capitalizing on the potential of photovoltaics – including solar panels and other technologies – to transform their electrical grids and environmental footprints. Now, a student and faculty research team at SUNY New Paltz has joined the effort to bring solar energy technology to new areas of the world, where its impact could be even greater. Adama Ouedraogo ‘18 (Electrical Engineering) came to the United States from Burkina Faso, a West African nation that lies between the Sahara Desert and the more tropical Sudan region. He’s had an interest in electrical engineering since high school, and arrived at New Paltz in 2016 with hopes of developing a concept he believed could improve everyday life in his home nation: a solar powered, portable medical cooler. The limited electrical infrastructure poses many challenges, but it is acutely felt by those who need medical treatment, and who may lack reliable transportation to urban hospital facilities. Ouedraogo thought a simple design could help solve this problem. He envisioned a system that would use photovoltaic panels to power a small refrigeration system for hours at a time – long enough to transport medical supplies safely across wide open spaces, even during times of intense heat. “There’s so many applications for this technology, but it’s ideal for coolers, because it removes the need for a coolant in a refrigeration system,” said Rachmadian “Doni” Wulandana, assistant professor of engineering and one of two faculty advisors who helped Ouedraogo develop his design. Wulandana is also part of the Sustainability Fellows program at New Paltz, which helps faculty bring sustainability into their classrooms and supports innovative, green research. 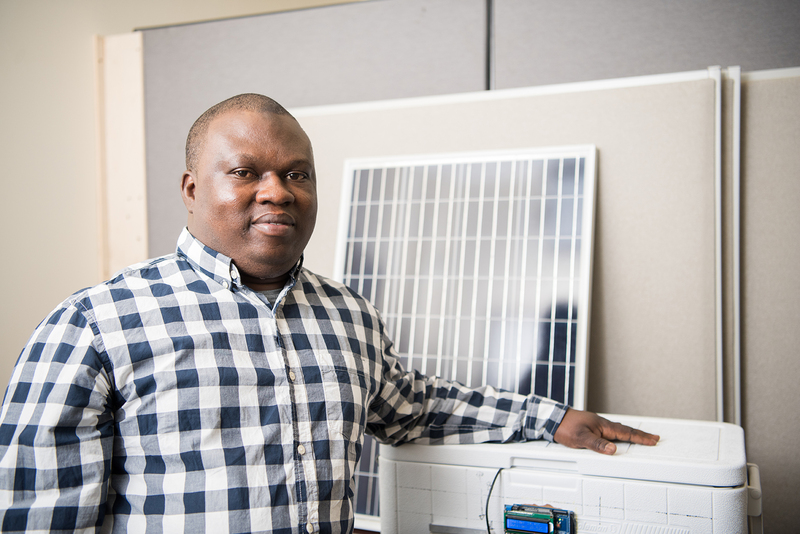 Working with Wulandana and Associate Professor Faramarz Vaziri, and with support from the Sustainability Seed Fund, Ouedraogo obtained a solar array, a thermoelectric semiconductor and a basic battery storage system. He developed the prototype and presented it to colleagues, peers and regional engineering professionals at the fall 2017 Engineering Design Expo, where his project was awarded one of the top prizes. 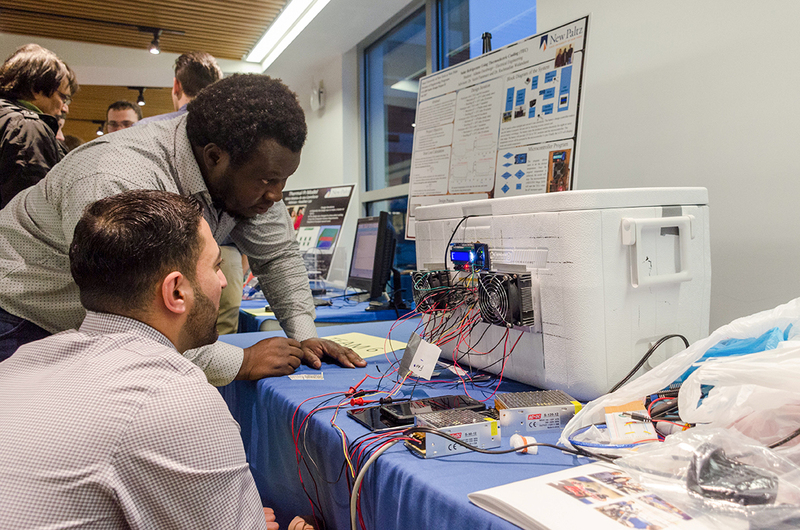 Ouedraogo will share an updated version of the prototype at the SUNY Undergraduate Research Conference, which will be held this year on April 20 at SUNY Onenota. Visit the Division of Engineering Programs online for more info. Learn about opportunities for international students via this page.